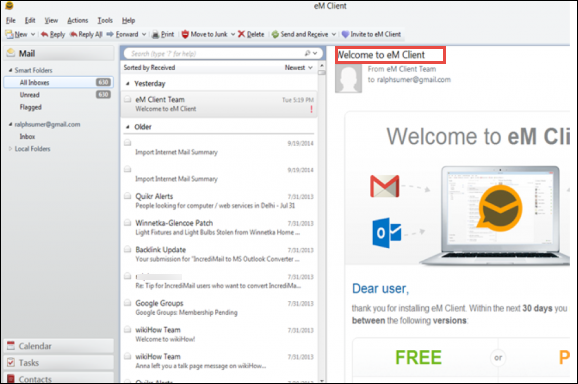 The eM Client is a Windows-dependent email service including to send and receive emails, managing calendars, contacts, and tasks. Apart from this, a user becomes unable to use the eM Client application by default an email platform and for business purposes as well. eM Client supports all email applications like Gmail, Apple Server, and IceWarp. Moreover, there are numerous of issues thus, it is necessary to import emails in Outlook. Nowadays, most of the users want to move eM Client to MS Outlook as it comes with Microsoft Office suites. It helps to manage the data and offers various functionalities as it allows to work in offline mode without internet connectivity. 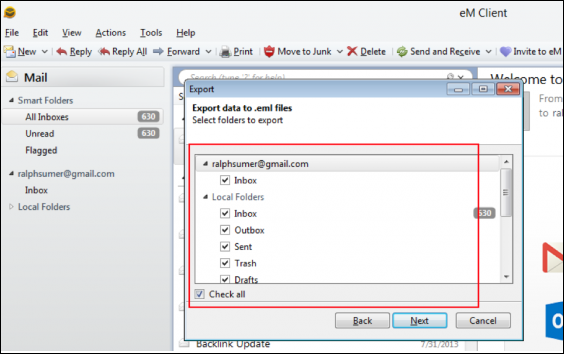 In the following blog, we will discuss the way to export eM Client to Outlook. 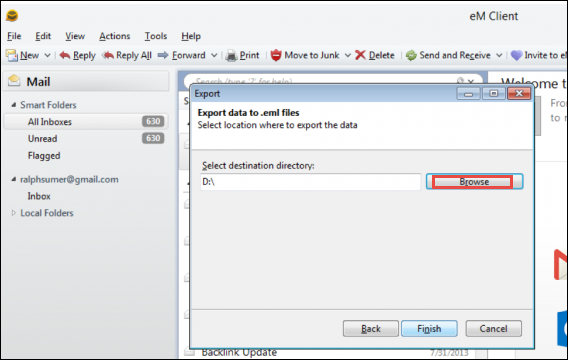 Step 5: Select the path where to save the exported data and then, Click Finish. After following such steps, a user will get eM Client emails into their local drive folder, after that, a user will want to import mailboxes from eM Client to MS Outlook. Even a user can go for an alternative tool named as EML to Outlook PST Converter Tool. It will beneficial for users to export eM Client to Outlook accurately and efficiently without any consequences. 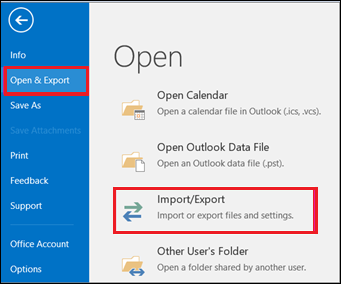 Note: If a user can’t import Outlook 2016 mailbox, then, select Import items into the current folder. This will assist to import the selected items into the folder. Step 8: In last, choose Finish. Outlook immediately begins to start import the contents of .pst file. It has completed when the progress box go away. 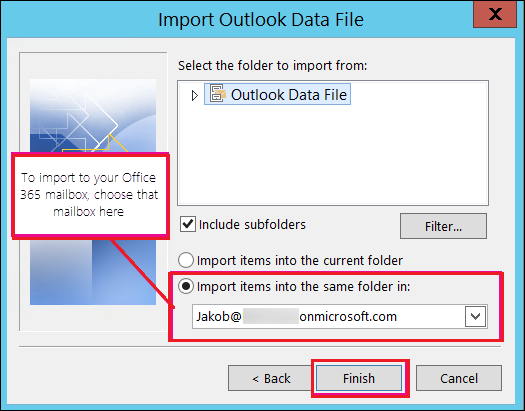 Note: If a user wants to import .pst file to Outlook 2016 mailbox, then, the message shows that it is trying to connect with Outlook 2016. This issue occurs when the Web connection will get interrupted, just for a second. 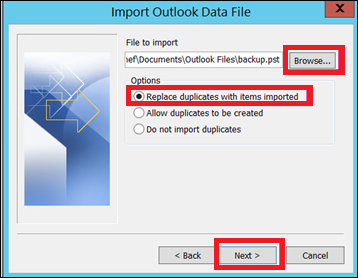 Once, a users internet connection has re-established and continued the process to import .pst file to Outlook. 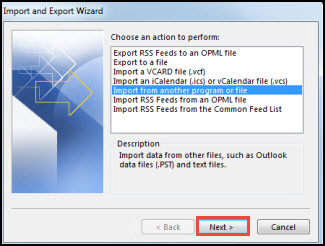 Suggestion: If a user need to retrieve few emails or contacts from an Outlook data items(.pst), a user can open the Outlook file and after this, in the navigation Window, drag the selected files and then, drop the emails and contacts from .pst file to existing MS Outlook folders. 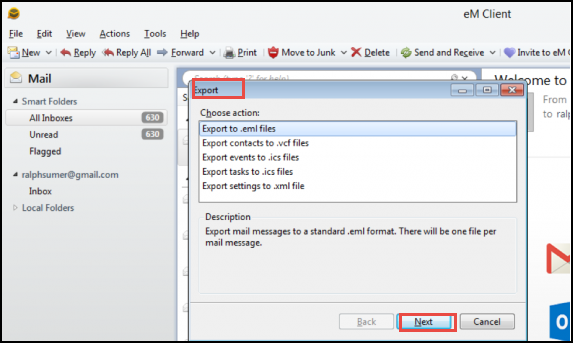 Considering the ongoing necessity to import eM Client to Outlook, we have described a simplified procedure to let the users understand How to export eM Client to Outlook. Well, it is recommended to first export eM client(.eml) to Outlook(.pst). Else, a user can go for other solution for resolving this issue by using third party tool i.e. 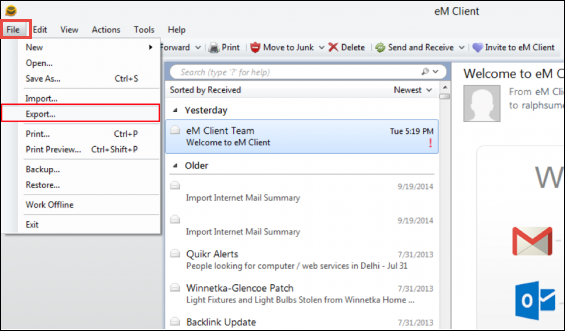 eM Client to Outlook Converter.